The power switch on the front panel allows you to quickly turn the splitter off when it is not needed without going for the plug. The image/sound quality might suffer if the HDMI cord is over 5m in length. 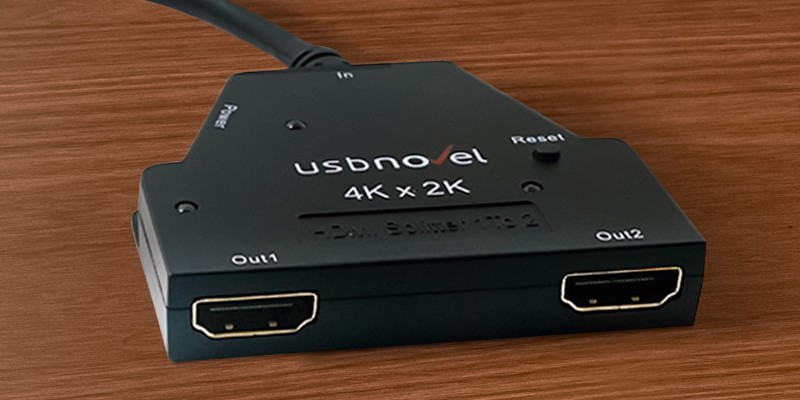 Owing to the HDMI v1.4 support, this model is able to transfer even the 4K UHD signal (3840x2160). 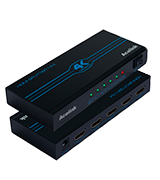 If you have a 4K LED TV-set, the Acelink AK005-UK is the best HDMI splitter for you. 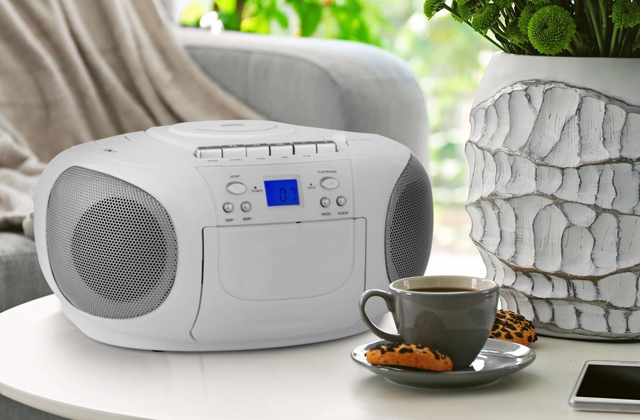 Features Left and Right RCA audio ports for connecting it directly with the speakers. 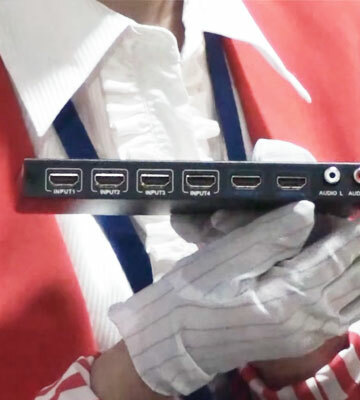 RCA outputs are available only for the first HDMI out port. This is a top of the shelf HDMI hub for building up a reliable interconnection and high-quality signal transmission between different digital devices. 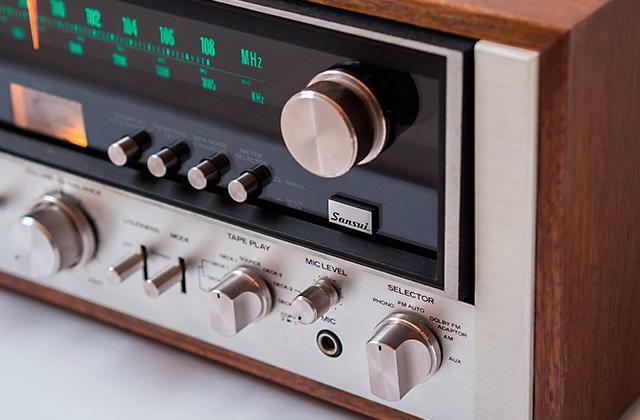 The metal casing and gold-plated connectors serve as a shielding from unwanted signal interference. A USB power cable comes without an outlet adapter. A dependable splitter for getting a signal from 1 source up to 4 displaying devices simultaneously without interference or signal loss via ≤10 m cables. 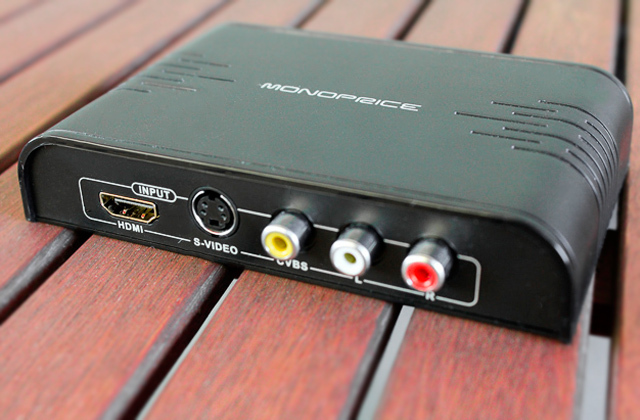 The splitter has a 20cm HDMI input cable already in place, hence, you can skip on buying at least one cable. The length is approx. 20 cm. The indicators might be too bright. 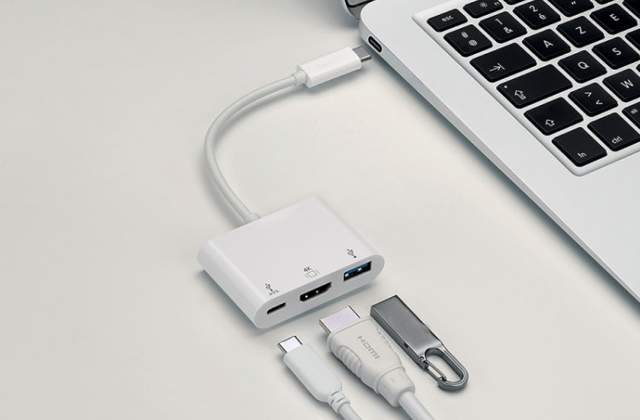 USBNovel here offers a highly functional model to organize all your multimedia gadgets in the room and forget about constant switching between ports. 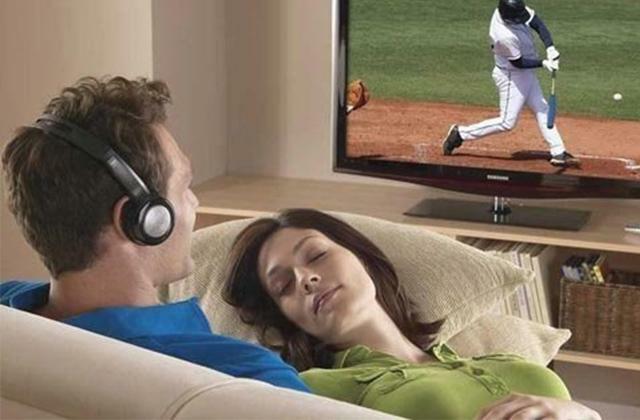 The image and sound quality stay absolutely undistorted. 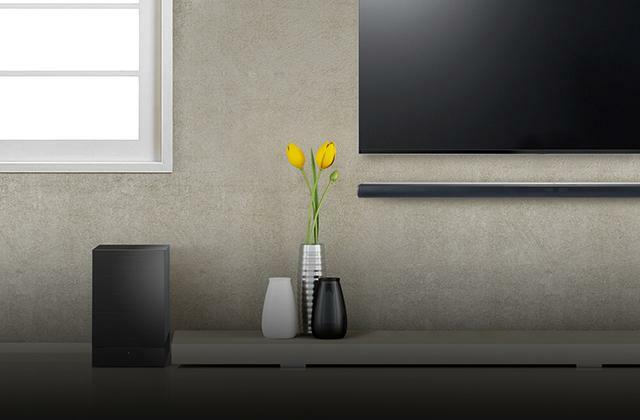 Owing to its small size, this switch-and-splitter combo is easily hidden behind your TV, which is especially convenient for wall-mounted TV sets with no shelves nearby. Heats up quite a bit. The best HDMI splitter for a home with several multimedia devices since it can work by transmitting both sides, from 2 devices to 1 TV or from 1 device to one of the 2 TVs with effortless switching. This Acelink model is a perfect choice if you need to transmit video and audio content in ultra-high resolution. 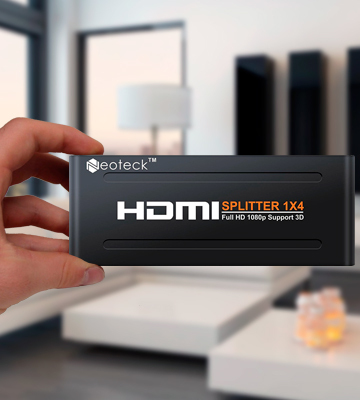 This splitter uses HDMI v1.4 ports, meaning it can easily handle files in 4K UHD and display the newest movies onto your large TV screens without any loss in quality. 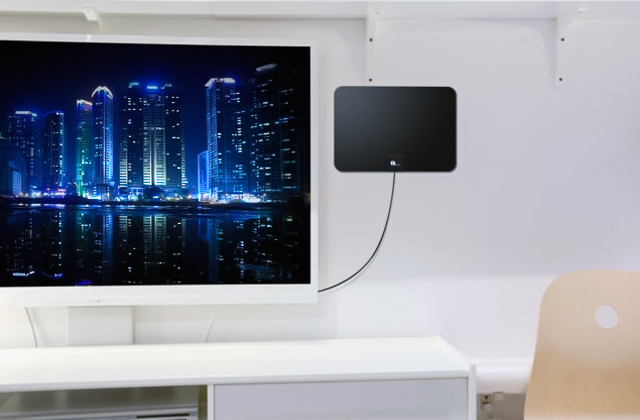 Furthermore, you can transmit the signal onto four screens simultaneously (although if you don't really need four and want to save your money, there is a 2-output model offered). It is especially convenient in, say, a sports bar where a lot of people come to watch their favourite games—they all wish it was in as best a quality as possible, right? 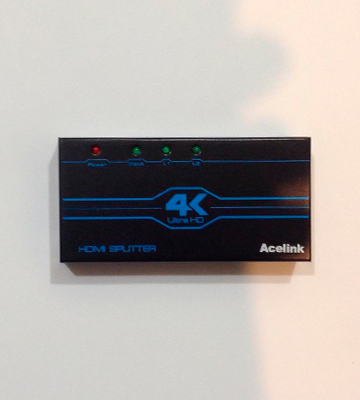 A splitter like this will also be appreciated at school, at a meeting with a big company, be it business or a night with friends, and even during political debates, this Acelink HDMI splitter will find its place. Even more so if you consider the distance it can cover: up to 50 or sometimes 66 feet; that's like 20 metres or something. The built-in IC chip allows this fairly compact device to analyse the signal, detect the resolution of the file you wish to watch, and then process it so that no quality is lost to the transmission. 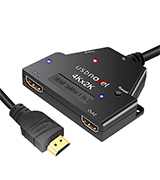 There are very few splitters better than this one; if anything, we can say that the only better ones can be the HDMI v2.0 splitters since they support 4K video recorded at 50–60 frames per second but the 2.0 standard is fairly new and still not spread everywhere so there is no guarantee your multimedia devices support it. The 1.4 one is the second best to the 2.0 only. What to do when you want to provide a signal from different HDMI devices to 1 or 2 screens at once? You can get a switch, then hook it up with a splitter, and then the splitter - to the screen. Or you can buy this E-SDS 4x2 HDMI Matrix Switch and save the trouble of having 1 device instead of 2 and any additional wires. Better yet, with this HDMI switch box, you also alleviate any possible incompatibilities between different interface versions of switchers and splitters. Also remember: fewer and shorter cables equal overall better signal quality. 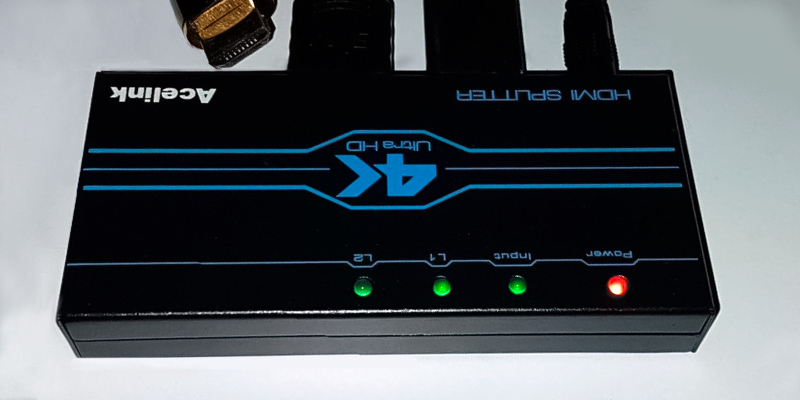 In other words, the E-SDS 4x2 HDMI Matrix can pick up a signal from up to 4 HDMI sources (PC graphic card, Blu-Ray player, HDTV STB, gaming console, etc.) and bring it to 1 or 2 displaying devices at once. You can quickly switch between the inputs via buttons on the front panel or with included small remote control. 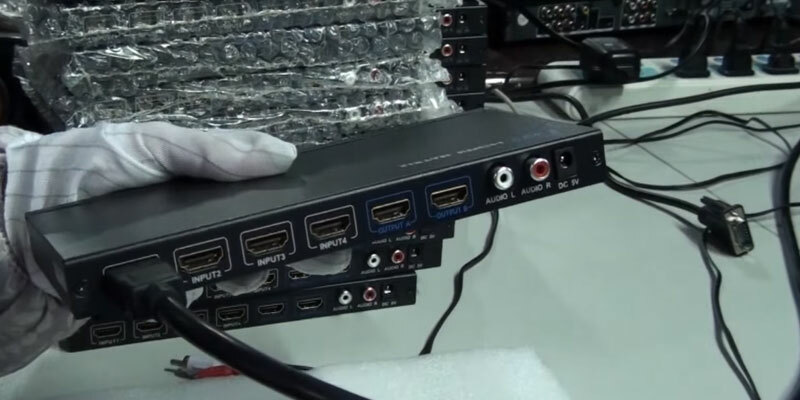 Anyhow, the major reason why we've picked up this particular model over many other HDMI matrixes is that it has separate L/R RCA audio out ports for the first HDMI out to connect them directly to the speakers. It's worth mentioning that, unlike some other matrixes, all of the ports, including the DC 5V one, are placed on the rear of the box, allowing you to neatly lay out all of the wires behind it. Concluding, this E-SDS 4x2 is the most versatile 4x2 switch/splitter combo for hooking up and sorting out all the wires of your electronic HDMI devices. If you ever wondered how they get the same fully synchronised video on different screens simultaneously in a cafe or shopping mall, the answer is quite simple. They use a splitter, just like this Neotek 4-way model. 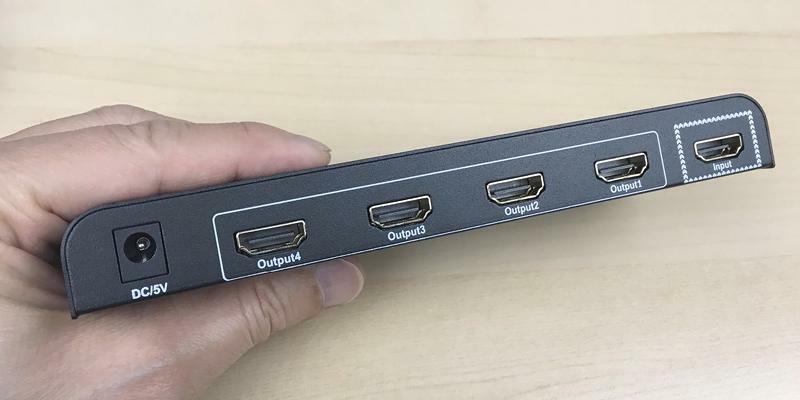 It can be connected to one source and divide the signal from it into 4 identical streams, sending them out from all 4 HDMI ports at once. Also, this splitter can be used for equipping your booth at an expo convention, a trade show or a product presentation to run the promo materials from your laptop on several screens at the same moment and attract more attention and a bigger number of visitors in that way. Anyhow, we give this device a high praise for a steady signal throughput without any noticeable interference that is partially achieved thanks to its metal casing design. 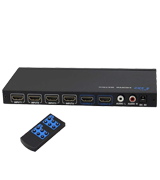 The Neoteck HDMI Splitter supports any data types, specified by HDMI 1.3b version, including 3D video on all 4 out ports. The recommended length of the HDMI cables in both directions is no longer than 10 m. In most cases, this is long enough to run the wire from one room to another without drilling a hole in a wall. 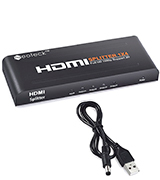 The Neoteck HDMI Splitter 4 Way comes with a short USB-to-5V DC jack cable that also renders an opportunity to connect a car DVD player to 2 backseat screens simultaneously. Inside a house or office, you can either hook it up to your computer or grab a plug adapter that usually comes with Android devices. 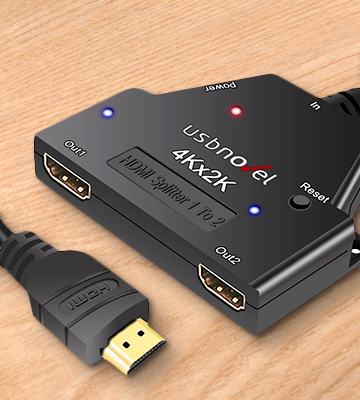 This USBNOVEL HDMI splitter is another one of the 4K-supporting HDMI v1.4 ones but the nice thing about it is that it is backwards compatible with v1.3 through v1.0 so you'll be able to use devices of previous HDMI generations with this splitter. There are two outputs in it and a single input, meaning you will have the opportunity to split the audio and video signals to two high-resolution screens. The model has a wide list of supported audio formats and can safely transmit video signals of a variety of resolutions from 480i to the abovementioned 4K no signal loss was detected even at a distance of 50 feet when the AWG24 cable was used. The list of devices this HDMI splitter is capable of working with is also quite extensive and includes, among others, the PlayStation 3 and 4 as well as Xbox 360 Elite, let alone Blu-Ray players and laptops. The peculiar benefit of this model is that it comes with an HDMI input cord already included, meaning you can save a couple quids on buying one specifically. It's not much, maybe, but we do believe it a good thing. The said cord is approximately 7.5 inches long so you can put the device near your source multimedia device and connect the output cords to the two TV screens or projectors. And if you need more outputs, the manufacturer also offers a 1-in-4-outs option. 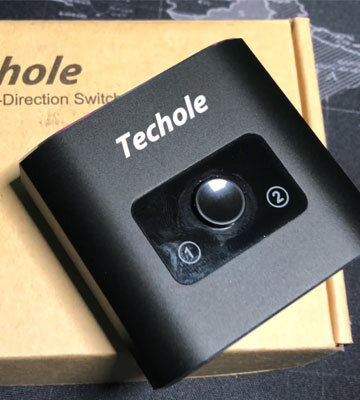 The Techole model is both a switch and a splitter. And the best thing about it is that all three of its ports can be used as both input and outputs. Well, not like three outputs or three inputs, obviously. We mean that the gadget works in two directions. 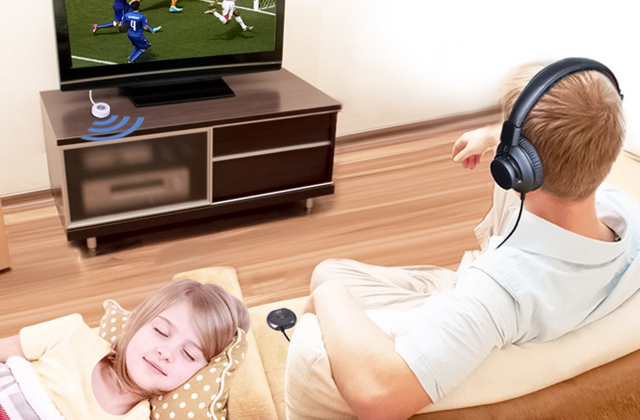 It has two ports on one side and one on the other and you can use them to either connect two TV sets to a single multimedia source or set the system with two sources (a laptop and a PS4, for example) transmitting to a single TV. It is a highly convenient option. That being said, the model can't display to both TVs simultaneously, that's not what it is made for. 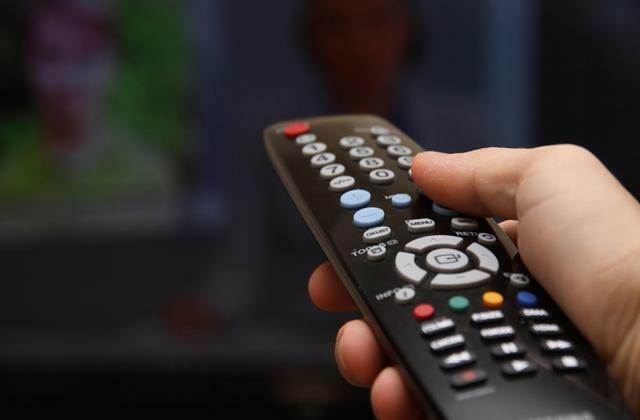 What it is made for is easy switching between the devices (either TV sets or sources) without you having to untangle the wires and reconnect. You will only have to push the button on the splitter and it will switch to another of the two connected devices. The currently operational port is indicated by a tiny LED light. The switch/splitter is the HDMI 1.4 version and can transmit video in 4K Ultra HD quality; the selection of supported audio formats is also fairly good, it includes Dolby TrueHD, DTS-HD Master Audio, and LPCM, among others. 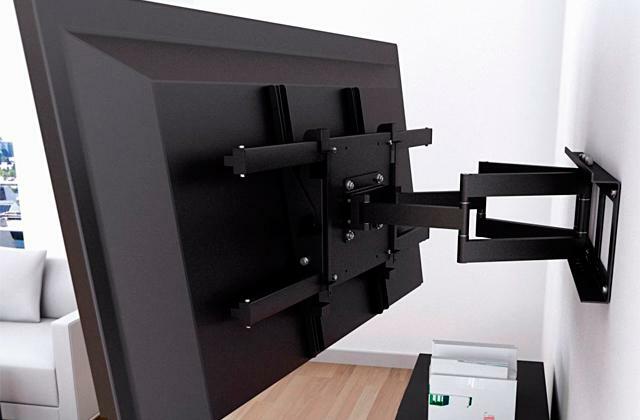 This is one of the smallest models on the market, which makes it a good choice for wall-mounted TVs since it is easy to hide behind the set. What Is an HDMI Splitter? Probably, every one of us has a lot of digital devices at our home or office. They connect our lives together and provide the means to work and relax. And yet, it's easy to get puzzled with the sheer number of cables they come with. So if you've ever struggled with switching HDMI cables from an STB, game console or PC to one TV screen, then these HDMI transmitters are the best solution. For starters, splitter-type transmitters grab a signal and duplicate it. After that, the twin signals from the splitter go to the several displaying devices simultaneously. HDMI switches, on the contrary, can transfer the signal from one or more devices to only one screen. Obviously, there are many types of such devices with their unique features on the market nowadays. That's why we came up with the idea to find out the best HDMI switches and splitters for all the typical situations that you may encounter while connecting all your HDMI-wired devices at your home or office. So check out this review and choose the best suitable one for your needs. And if you are looking for other PC hardware, take a look at our USB hubs and memory card readers reviews. First of all, make sure you know exactly the kind of HDMI transmitter's functionality you require. Once again, splitters are designed to take an incoming signal, duplicate it and send out to 2 or more displays. Switches are used for connecting many devices to one monitor or TV screen in order not to plug them in and out each time. And if you want the qualities of both, then get an HDMI matrix – it can transfer the signal from many devices to one or more screens. And sometimes it's easy to forget how many things we have in our houses. So count up devices with HDMI cables that you have, check out HDMI versions that they work with (you can find this info in the manuals), and then choose the transmitter with port specs that will satisfy your needs. 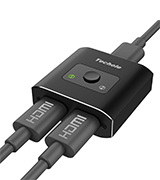 Keep in mind that HDMI is backwards compatible and every HDMI version supports the characteristics of a previous one. The forward compatibility is another story, though, so there is still a couple of pitfalls you’d want to avoid here. Some devices may not be compatible due to the HDMI version differences. Helpfully, that info can also be found in the manuals. So don't forget to compare the supported formats. Controls are the last but not the least important thing to check out. 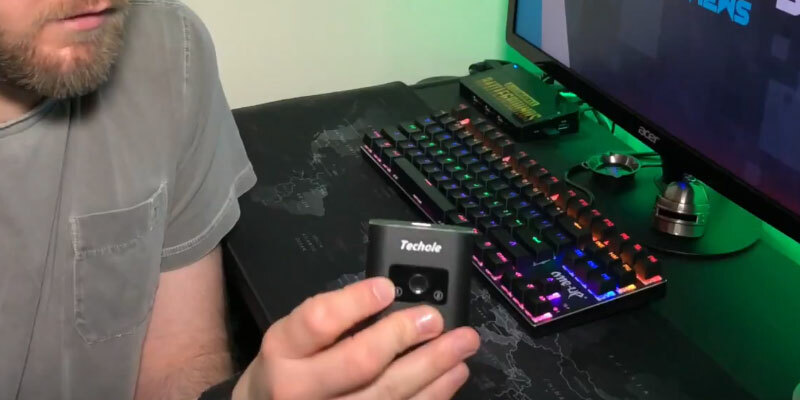 The switches and splitters may come with a wireless IR remote that can come in handy if you are going to put the device far from your hand’s reach, while others may only have a control button right on the body. 1. Zachary Medved Splitters and Switches and Matrixes, Oh My! Sewell Direct. 2. HDMI Splitter, Tech-FAQ. March 11, 2016. 3. HDMI Splitter or HDMI Switch? 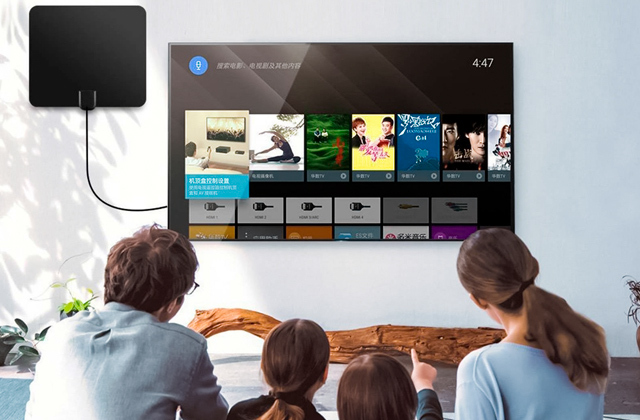 The Easiest Way to Connect Multiple Devices to Your TV, eBay. April 14, 2015. 4. How to use an HDMI Switch to Connect More Devices to One Monitor, Tom's Hardware. November 28, 2013. 5. 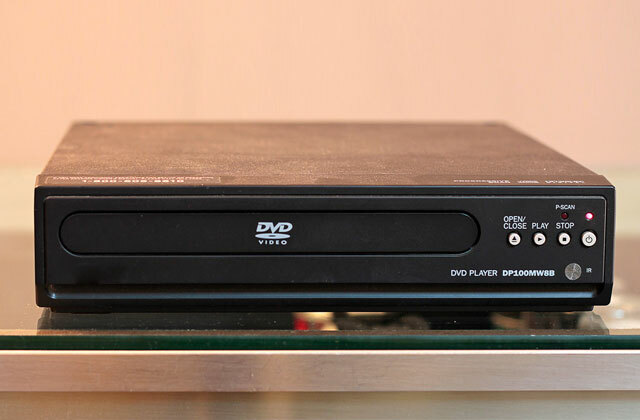 What’s a Matrix Switch and Why Your A/V System or Home Theater Needs One, Electronic House. July 15, 2015.